Guangbo love continues. 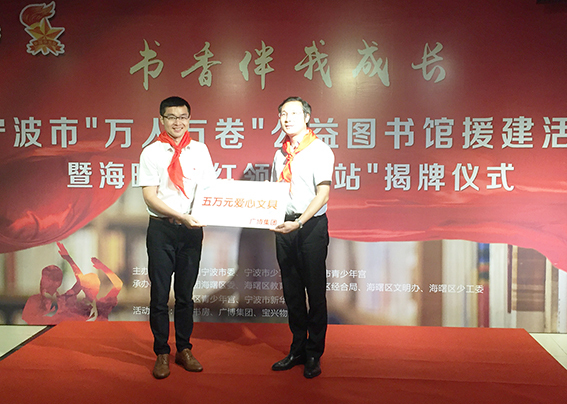 On the afternoon of May 30, at Ningbo public welfare library construction activities and Haishu district "red scarf e station" unveiling ceremony activities, Shu Yueping, deputy secretary of Guangbo Group Party committee, on behalf of the company donated 50 thousand worth of stationery products to the activities. It is reported that this batch of love stationery will be used for public welfare assistance. This is Guangbo again associated with public welfare activities. For a long time, while doing well in the development of enterprises, Guangbo has been actively carrying out social responsibilities. As a domestic professional cultural manufacturing enterprise, Guangbo has always been concerned with the educational cause of our country. And it also commits to help poor, remote and backward areas of children for a long time. In addition to contributing to the construction of Hope Primary school, Guangbo also actively carry out pair study activities. And set up a special student fund, let poor students can feel the warmth and positive energy of society when they finish their studies. Up to now, the amount of materials donated by Guangbo on education and public welfare has exceeded over five million yuan. Under the guidance of "public welfare is not an attitude, but a responsibility", Guangbo will also help more poor students, let this public welfare student love relay continue.